People don't change cars nearly as often as they upgrade handsets, and even if you're not happy with your car's stereo head unit, it may not be practical simply to change it for a new one. Increasingly, audio and other in-car functionality is built in and essentially non-upgradeable. At least not in the sense of ripping out the head unit and banging in a new one. On the other hand, a lot of add-on kit from aftermarket manufacturers can be downright messy. Added cables, patchy reliability, the usual drill. In theory, the Pure Highway 300Di offers a solution. You get DAB radio, iPod support and USB connectivity in a single, neatly integrated package. No wires, no mess. The fully fitted price from Halfords is currently £180. It's certainly a slick-looking package at a reasonable price. And brief acquaintence will convince you it's worth considering. But living with this kind of gadget long term often throws up a few niggles. So what's six months with the Pure Highway 300Di really like? The answer is mixed. In terms of features, it's mostly good news. The mix of DAB, USB, iPod and line-in pretty much covers all your audio bases. You also get to choose where to locate the line-in and USB connections, so you've no-one but yourself to blame if you're not happy with that. One major shortfall in this area is telephony support. There is none. What the Pure Highway 300Di really needs is a Bluetooth interface. We suspect an upcoming model will get just that. The other issue in this area involves the way the Pure Highway 300Di hooks up to your car's audio equipment. In some cases, you can loose analogue radio functionality in the process. Hold that thought. When it comes to USB, line-in and iPod / iPhone functionality, the answer is simple. It's a yes. We have had occasional glitchiness involving random refusal to recognise an iPhone, but reconnecting has always sorted things out. Once connected, the Pure Highway 300Di's screen and rotary control make browsing music libraries reasonably ergonomic. OK, it's a little slow to respond to requests for new tracks. But it's tolerable. The ability to pause live radio for up to 15 minutes is very nice, too. Much more of an issue is the radio reception. Our installation involved the windscreen- rather than roof-mounted aerial. The roof-mounted option provides the best reception, but isn't possible with convertible cars. As is happens, our test car's head unit also lacked a line-in. In this scenario, the Pure Highway 300Di is plumbed into the the radio aerial input and means you lose analogue radio functionality. In theory that's fine, because now you have many more channels via DAB. In practice, DAB coverage remains patchy, so you can be left with nothing. This was exacerbated in our test car by the use of the screen aerial. Put another way, the screen aerial combined with a lack of line-in is the worst possible setup for the Pure Highway 300Di, and one we'd advise against. Other niggles include sluggish switching of radio stations and infuriating management of the station list. By the latter we mean the way you're never quite sure what's going to happen when you twist the rotary dial to select a new station. You might move to the next station in the list alphabetically. Or you might find yourself half way down the list. It's probably related to the way stations drop in and out of range. But it needs sorting. 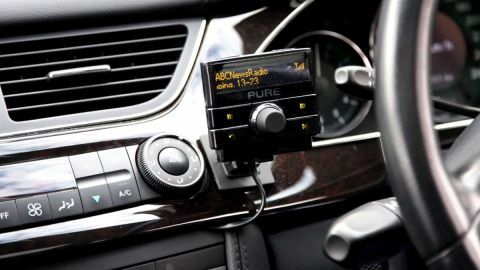 Finally, during a recent trip in Europe, the Pure Highway 300Di failed to pick up any local stations, despite claims that it's Euro-compatible out of the box. Two thirds of the Pure Highway 300Di experience is a joy. It's a nicely presented unit and mostly a pleasure to use. We reckon the fully fitted price is right and in terms of functionality only wants for Bluetooth. But there are issues to be aware of. If your car isn't compatible with the roof aerial or you're not willing to have it fitted, we'd say don't bother. Similarly, if your car's audio system doesn't have a line-in, we'd advise against the Pure Highway 300Di because you'll lose standard analogue radio, and that's not acceptable. However, if you have a tin-top car with line-in, we reckon you'll really enjoy the Pure Highway 300Di. Highly recommended.